04/17/19 - EcoLine® Drilling Rod Grease Featured in New Equipment Digest! 12/18/18 - EcoCortec® Debut at FachPack 2018! 11/20/18 - Handy Intro Sheet Now Available for Cortec® Removable Coatings! 10/25/18 - European Sales Meeting and New EcoCortec® Plant Opening! 09/07/18 - AFRICORR 2018 "Expanding Cortec's Footprint in Africa"
07/11/18 - Save the Date for CorrTango 2018 in Buenos Aires, Argentina! 06/08/18 - Cortec® VpCI® Additives Make American Coatings Show a Success! 06/07/18 - Cortec® and Presserv at NACE Conference in Genova, Italy! 05/25/18 - Bionetix® International Successfully Passes ISO 9001:2015 Quality Management System Transition Audit! 05/17/18 - DIN CERTCO Verifies Cortec's Certification to Use "Seedling" Logo on Two Compostable Products! 04/25/18 - Save the Date for Cortec's 2018 Asia-Pacific Sales & Strategy Meeting in Shanghai, China! 04/16/18 - CortecRus and Cortec® Corporation presented VpCI® Technology at the Seminar Organized by KAMAZ! 03/20/18 - Success of Cortec's CorroLogic® Solutions, Cortec's Distributor Presserv Nominated for Innovative Technology Award! 03/14/18 - MCI® Technology Presented to Major Companies in Southeast European Market! 03/07/18 - Cortec® VCI Article One of Five Most-Viewed Stories for Oil & Gas Engineering in 2017! 03/01/18 - Cortec® Corporation Successfully Passes ISO 9001:2015 Transition Audit with No Non-Conformances! 02/02/18 - Cortec's 2018 European Sales and Strategy Meeting Promises to be a Milestone Event! 01/31/18 - Cortec® Europe Team Announces European Sales & Product Training in Beautiful Split, Croatia! 01/11/18 - Cortec's CorrTainer Boxes Among 2017 Biggest Packaging Gateway Stories! 01/02/18 - Groundbreaking Ceremony For EcoCortec's New Plant! 12/15/17 - Great Interest in Cortec's CorroLogic® Solutions at Stock Expo in Germany! 12/08/17 - NEWS ALERT: Another Class Graduates from Cortec® University! 11/22/17 - Cortec® Middle East - Great Success at ADIPAC- One of World's Most Influential Events for the Oil and Gas Industry! 09/26/17 - Cortec® Welcomes Cambridge and Beli Manastir Delegations for CAF Groundbreaking Ceremony! 09/25/17 - Members of Cortec® European Group at the Largest Scientific Corrosion Event Ever Held in Europe! 09/22/17 - Cortec® Friends and Family Gather for 2017 World Sales Meeting and 40th Anniversary Celebration! 08/23/17 - Cortec® Biotechnology Campus Improves Productivity and Turnaround Time with New Liquid Blending Line! 07/14/17 - NACE Materials Performance Double Features Cortec® Corrosion Solutions! 06/27/17 - Research Paper on Biobased Rust Coatings To Be Presented at EuroCorr 2017! 06/14/17 - Cortec's 40th Anniversary Highlighted by "The Voice of the Water Treatment Industry"
06/13/17 - Carte Dozio and Cortec® Successfully Present VpCI® Technology at Leading Conference Forum for Integrated Valve Technologies! 06/02/17 - Cortec® Releases White Paper on NASA Seawater Rinsedown Testing of EcoShield® 386! 05/25/17 - Cortec® Corporation Passes Quality Audit with No Non-Conformances! 05/18/17 - Cortec® Builds MCI® Relationships at 2017 ICRI Spring Convention! 05/15/17 - Cortec® Named Top Player In the Global Organic Corrosion Inhibitors Market 2017! 05/04/17 - Cortec® Makes Significant Contributions to NACE CORROSION 2017 Conference! 04/27/17 - Cortec® Launches 2017 World Sales Meeting Website and Counts Down to Festivities! 04/20/17 - Cortec® Advanced Films Improves Quality and Safety and Reduces Waste on Busiest Extrusion Line! 04/14/17 - Cortec® Receives Special Invitation to JSWAG-JFOWG! 04/13/17 - New Economical Environmentally Safe Corrosion Inhibitor For Multiple Applications Featured in IPCM Magazine! 04/07/17 - Cortec® Seeks Continued Education and Market Exposure at Purdue Short Course! 03/29/17 - Cortec® White Paper Explains the "Power of Diminishing Particle Sizes"
03/24/17 - Bionetix® International Discovers Big Results at ISSA/INTERCLEAN Latin America! 03/16/17 - Cortec® Makes Important MCI® Connections at World of Concrete 2017! 03/09/17 - Cortec's High Performance Coatings Attract Attention at SSPC 2017! 03/03/17 - Cortec® Lab Finds Six-Year-Old VpCI® Film Still Effective! 02/23/17 - Corpac Switzerland and Egolf Share VpCI® Solutions at Important Prodex Tool and Manufacturing Fair! 02/15/17 - Celebrating 40 Years Offering Innovative Corrosion Control Solutions, Cortec® Corporation Announces The Upcoming 2017 World Sales Meeting! 02/10/17 - Cortec® Publishes Informative White Paper Detailing EcoSonic® ESD Paper Applications for EMS and MEAS Industries! 01/26/17 - Cortec® Encounters Unexpected Opportunities andOffers Corrosion Solutions for all at Power-Gen®*! 01/13/17 - Cortec® Celebrates Another Record-Breaking Year and Recognizes Employee Accomplishments! 01/09/17 - Important Industry Magazine Recognizes Cortec's Commitment to Discovering Natural Solutions! 12/21/16 - Cortec® Finds Good Name Recognition and New Ideas at World's Largest Packaging Show! 12/16/16 - Technical Excellence Article Published in the New Civil Engineer Magazine: Severn Bridge in UK one of 5 Most Beautiful Bridges in the World Protected with Cortec VpCIR Technology"
12/08/16 - Latin American Sales Meeting Offers Time of Reunion and Renewed Vision! 11/23/16 - Cortec® and Valued Distributors Fill an Important Role at LATINCORR 2016! 11/08/16 - Bionetix® International Gains Valuable Insights at ISSA/INTERCLEAN 2016! 11/03/16 - Cortec® Corporation Sees Record Attendance at 2016 Asia Sales Meeting! 10/13/16 - Cortec® and Corpac Team Up to Reinforce Strong Market Presence at 2016 FachPack Show! 10/10/16 - Cortec® Corporation's Desalination Brochure Now Available in Portuguese! 09/28/16 - Bionetix® International Celebrates 20th Anniversary of Providing Natural Bioremediation Solutions! 09/23/16 - Corrosion Adventure at EuroCorr and European Sales Meeting 2016! 09/21/16 - Cor-Pak® VpCI® Static Dissipative Bubbles Film Available at Cortec® Warehouse! 08/24/16 - Cortec® Corporation Featured Twice in August New Equipment Digest Magazine! 08/19/16 - Global Voice in Technical Coatings Solutions Publishes Cortec® VCI Transportation Coatings Article! 07/29/16 - Cortec® Named as Major Player in the Specialty Films and Active Intelligent Packaging Markets! 07/01/16 - Cortec® Named A Major Player In The Global Water Treatment Chemicals Market! 06/08/16 - Cor-Pak® VpCI® Static Dissipative Bubbles Film Available at EcoCortec® Warehouse! 06/03/16 - Fredonia Group Study Features Cortec® - Global Leader In VCI Industry! 05/29/16 - First Distributor Training at EcoCortec® Plant! 05/25/16 - Cortec® Attends The 2016 Caterpillar Corrosion Engineering Conference! 05/18/16 - Cortec's "VpCI® Technology For Desalination Industry" Brochure Featured In May Issue of Coatings Pro Magazine! 05/05/16 - Corpac Represents Cortec® VpCI® Technology at EMPACK 2016! 04/25/16 - Cortec® at KORMAT International Conference! 04/19/16 - PCE International Magazine Features Cortec's Offshore Platform Caisson Legs Protection! 04/15/16 - Cortec® Corporation Welcomes Back James E. Holden, P.E.! 03/31/16 - Cortec® Announces Its 500th Case History On Inhibiting Corrosion Across The Globe! 03/15/16 - Cortec® Presents Six Papers at CORROSION 2016! 02/12/16 - Cortec® Brings High Performance Nano VpCI™ Coating Technology to the 2016 SSPC! 02/04/16 - Cortec's "VpCI® Technology for Automotive Industry" Brochure is Now Available in Portuguese! 12/16/15 - Successful CORCON-2015 Leads The Way For Corrosion Control Bureau Of India! 12/10/15 - Cortec® Featured Twice In December 2015 Issue Of New Equipment Digest! 11/30/15 - Cortec® Lab Finds 20 Year Old Cortec® Emitter Still Provides Excellent Corrosion Protection! 11/23/15 - Cortec® Middle East Sponsors Technical Seminar For Ministry Of Water And Electricity (MOW&E) - General Directorate Of Water Eastern Province! 11/19/15 - Cortec® Advanced Films Increases Efficiency on Extrusion Line 21! 11/12/15 - Cortec® and Bionetix® Featured In November/ December Issue of Pollution Equipment News! 11/05/15 - Cortec® And Corpac Attend The 2015 Fachpack - Leading The Industry In Corrosion Protection! 11/05/15 - EcoCortec® Announces Expanded Warehouse and a New High Tech Converting Line for Patented VpCI® Resealable Bags! 10/27/15 - New Equipment Digest Features Cortec® EcoFog® VpCI®-309 Nano And CorShield® VpCI®-146 Creped Paper In Their October Issue! 10/07/15 - Pollution Equipment News Features Three Cortec® Articles in August/September Issue! 10/02/15 - Cortec® Attends Exponor 2015 As The Only Corrosion Prevention Solution For The Mining Industry! 09/25/15 - Multinational Giant Bosch Utilizing EcoCortec®'s High Tech, CoExtruded Static Dissipative Bags! 09/25/15 - Cortec's 32nd World Sales Meeting - The Most Successful Yet! 09/14/15 - Record Number of Visitors at Cortec®'s Booth at European Corrosion Conference - EuroCorr! 08/24/15 - 2015 Cortec® India Sales Meeting - Celebrating 10th Anniversary Of Incorporation! 08/12/15 - 08/12/15 NEWS ALERT: Cortec's VpCI® -643 Featured In July Issue of CoatingsTech Magazine! 08/05/15 - News Alert: Cortec's Corrblock™ Featured in June Issue of Power Engineering Magazine! 07/10/15 - Cortec's VpCI®-643 Featured in Hot New Products Editors Choice Section of New Equipment Digest! 07/01/15 - Cortec® Presents June 2015 Supplement To Materials Performance Magazine! 06/24/15 - Cortec's EcoLine® Food Machinery Lubricating Grease Featured In June Issue of Industrial Equipment News! 06/11/15 - Cortec® President/CEO - Boris Miksic, FNACE Shares His Journey As A Keynote Speaker At The 2015 NACE Corrosion UAE! 06/05/15 - Cortec's CORROSION 2014 Paper #4250 Featured in June Issue of Materials Performance! 05/28/15 - Cortec's CorrBlock™ Featured in May Issue of Water World Magazine! 05/21/15 - Cortec's High Performance Lubricant Brochure and VpCI®-126 UV Film Featured in May Issue of New Equipment Digest! 05/15/15 - Cortec® Promotes MCI® at MADE EXPO! 05/08/15 - Cortec® President/CEO - Boris Miksic, FNACE To Be Keynote Speaker At Corrosion UAE! 05/06/15 - Cortec® Corporation's VpCI® and MCI® Technology Presentations Now Available Online! 04/21/15 - Nitrite Free Cortec® VpCI®-146 Paper: Global Packaging Solution For The Automotive Industry! 04/16/15 - Cortec® Recognized for Innovative EcoAir® Technology! 03/13/15 - Cortec® Middle East Regional Meeting Sets The Path For A Successful 2015! 03/05/15 - Cortec® Middle East Sponsors Technical Dinner Meeting At NACE Jubail-Saudi Arabia! 02/27/15 - Cortec® Middle East Launches The First Integrated Corrosion Solution Partnership In The Kingdom Of Saudi Arabia! 02/18/15 - Cortec® VpCI®-705 Featured In February Issue Of Oil & Gas Engineering! 02/13/15 - Cortec® On The Cutting Edge Of Inkjet Printing Innovation On VpCI®-137 And BioPad® Products! 01/09/15 - Cortec® Featured Twice In Coatings Pro Magazine! 12/31/14 - Cortec® Featured In December Issue of Chemical Engineering! 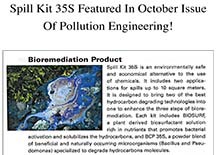 11/27/14 - Spill Kit 35S Featured In October Issue of Pollution Engineering! 11/18/14 - Cortec® Dominates PackExpo With Innovative Packaging Technologies! 11/07/14 - Cortec® Brings Global Innovation To LatinCorr 2014! 11/06/14 - Obama Announces New Initiative To Stregthen U.S. BIO-BASED Manufacturing! 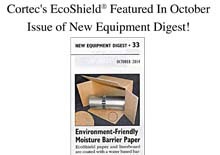 10/22/14 - Cortec's EcoShield® Featured In October Issue of New Equipment Digest! 09/26/14 - Cortec® Middle East Continues To Strengthen Its Partnerships With Local Academic Institutions Through The Cortec® Internship Program! 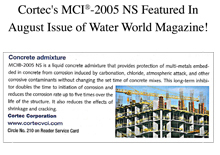 09/13/14 - Cortec's MCI®-2005 NS Featured In August Issue of Water World Magazine! 08/20/14 - Cortec's MCI®-2012 IntegraPel Featured In WaterWorld Magazine! 08/13/14 - Cortec® Presents Advanced Corrosion Inhibitor Technology To AHK Santa Catarina - Brazil! 08/07/14 - Cortec's CorShield® VpCI®-386 HP Featured In July Issue of Coatings Pro Magazine! 07/23/14 - Cortec's MCI® Wall Defense Featured In July Issue of Portable Restroom Operator! 07/03/14 - Cortec® Middle East Hosts "How to Grow your Cortec Business"! 06/20/14 - Bionetix Setting High Standards With ISO 9001:2008 Recertification! 06/10/14 - Cortec® Attends RAILCORR 2014 Seminar! 05/28/14 - Cortec® EcoSonic VpCI®-105 Emitters Featured in May Issue of Chemical Engineering! 05/23/14 - Cortec's MCI®-2005 In Al Jalila Hospital Featured At Zawya! 05/16/14 - Bionetix Porta-Treat Featured In May Issue of Portable Restroom Operator (PRO) Magazine! 05/08/14 - Cortec's CorrVerter® Featured in April Issue of Pollution Equipment News! 05/02/14 - Cortec's EcoLine® 3680 Featured In April Issue of Pollution Engineering! 04/25/14 - Ecuadorian Engineers Visit Cortec®! 04/15/14 - Cortec's MCI®-2012 Integrapel Featured In April Issue of Coatings Tech Magazine! 04/08/14 - Bionetix® Porta-Treat Featured In April Issue of Pumper Magazine! 04/04/14 - Cortec's BioClean® Spray Featured February Issue of Pollution Engineering! 03/28/14 - Cortec® Featured In NACE Corrosion Press! 03/25/14 - Cortec's VpCI®-637 TOL Featured March Issue of Waste / Wastewater International! 03/18/14 - VpCI® Super Penetrant Featured In March Issue Of New Equipment Digest! 03/11/14 - Bionetix® Eco Sept Featured In March Issue Of Pumper Magazine! 03/04/14 - Cortec's CorroLogic Brochure Featured In Free Literature Section of Process Coolings March Issue! 02/26/14 - Cortec&REG; CorPak&REG; Tablets Featured in January/February Issue of Machinery Lubrications! 02/20/14 - New Equipment Digest Features Two Cortec® Articles In February Issue! 02/14/14 - Cortec® VpCI®-132 Foam Pads Featured In February Issue of Lubes'N'Greases! 02/07/14 - "Miksic Achieves 40 Years At NACE" Featured in February Issue of Materials Performance! 01/30/14 - New Equipment Digest Features Two Cortec® Articles In January Issue! 01/15/14 - Cortec's EcoLine® 3680 Featured In January Issue Of Materials Performance! 12/31/13 - Cortec's BioClean® Spray Featured In New Equipment Digest! 12/17/13 - Cortec® Now Registered With Cefas - OCNS! 11/27/13 - Cortec's VpCI®-328 Featured In Industrial Equipment News Magazine! 11/19/13 - Cortec's VpCI®-144 Featured In New Equipment Digest Magazine! 11/15/13 - Cortec® Represented At Vital Tradeshows Globally By Our Representatives And Distributors! 10/17/13 - Cortec's MCI-2019 Featured inCoatingsPro Magazine! 09/26/13 - Cortec Mission Possible! 09/23/13 - Cortec Cor-Pak Tablets Featured in September Issue of New Equipment Digest! 09/18/13 - Cortec VpCI-637 TOL Featured in July/August Issue of Upstream Pumping Magazine! 09/12/13 - Cortec VpCI-637 TOL Featured in July Issue of Pollution Engineering Magazine! 08/22/13 - Cortec MCI-2019 Featured in July Issue of Buildings Magazine! 08/08/13 - Cortec MCI-2019 Featured in June Issue of Coatings World Magazine! 08/06/13 - Aloha From Cortec! 07/31/13 - Cortec CorShield VpCI Transit Coating Featured in May/June Issue of Green Manufacturer Magazine! 07/17/13 - Cortec MCI Wall Defense Featured in June Issue of Industrial Equipment News Magazine! 07/10/13 - Cortec CorrLube Food Grade Penetrant Featured in June Issue of New Equipment Digest Magazine! 06/26/13 - Cortec Closed Loop Toad Featured in May/June Issue of Industrial Waterworld Magazine! 06/06/13 - Cortec Website Featured in May Issue of CoatingsPro Magazine! 05/30/13 - Cortec MCI Wall Defense Featured in April Issue of Buildings Magazine! 05/22/13 - Cortec VpCI Super Penetrant Featured in April Issue of Pollution Equipment News! 05/15/13 - Cortec CorShield Featured in April Issue of Coatings World! 05/09/13 - Cortec VpCI-337 Featured in February/March Issue of Water World International! 05/02/13 - Cortec VpCI-390 Featured in April Issue of Concrete Repair Bulletin! 04/24/13 - Cortec VpCI Super Penetrant Featured in April Issue of New Equipment Digest! 04/24/13 - Cortec Profiled In Freedonia Study For Corrosion Inhibitor Market! 04/16/13 - Cortec MCI Wall Defense Featured in March Issue of Coatings Pro Magazine! 04/03/13 - Cortec VpCI-148 Featured in January Issue of BioFibre Magazine! 03/21/13 - Cortec Announces 23rd World Sales Meeting! 03/13/13 - Cortec's EcoLine 3220 and 3690 Featured in January-February Issue of Machinery Lubrication Magazine! 02/28/13 - Cortec's M-605 PS Awarded BioPreferred Labeling! 02/22/13 - Corpac Electrifies Pack&Move 2012! 01/30/13 - Cortec Profiled in January Issue of Coatings Pro Magazine! 01/23/13 - Cortec VpCI-148 Featured in December Issue of BioCycle Magazine! 01/09/13 - Cortec® CorroLogic™ System for Cased Pipeline Crossings Featured in December Issue of Materials Performance Magazine! 01/04/13 - Congratulations to Cortec Korea! 12/12/12 - Cortec® Nominated For The MP Readers Choice Corrosion Innovation of the Year Award! 11/28/12 - Cortec Asia Pacific Meeting Concludes in Gangnam Style! 11/20/12 - Cortec CorroLogic Featuredin November Issue of Materials Performance Magazine! 11/15/12 - Cortec EcoWorks Featured in September Issue of Biocycle! 10/25/12 - Cortec VpCI-609 Powder Featured in June Issue of Pollution Equipment News! 10/16/12 - Cortec VpCI-325 Featured in August Issue of New Equipment Digest! 08/15/12 - CorteCros: Cortec's First Joint Venture Still Going Stonger Than Ever! 08/02/12 - Cortec's VpCI-395 Featured in July Issue of Biocycle. 07/26/12 - Cortec's VpCI-125 Film Featured in May Issue of Packaging World. 07/18/12 - Cortec Featured in April Issue of Lubes'N'Greases. 07/12/12 - HITEK-nology Solutions LTD Exhibits at DVD Conference. 07/10/12 - Cortec Has A New Face And New Office in Kansas! 06/14/12 - Cortec EcoOcean™ Featured in Middle East and India Coatings & Converting. 04/25/12 - Marine Clean presented in Croatian Chamber of Commerce! 03/01/12 - Eco Cortec - partner in EU financed eco project 'Marine Clean'! 01/19/12 - Cortec's BioPreferred Products Featured in November/December Issue of Concrete Repair Bulletin. 01/12/12 - Cortec VpCI-380 Featured in November/December Issue of Concrete Repair Bulletin. 10/18/11 - Cortec Featured in August Issue of BioCycle Magazine. 09/22/11 - Cortec Showcased in September Issue of Materials Performance Magazine. 09/15/11 - Cortec Announced As Finalist By Twin Cities Business Magazine! 08/18/11 - Cortec's Eco-Corr Film® Featured in BioPlastics Magazine. 08/11/11 - Cortec Adds to its List of Approved USDA BioPreferred Products! 06/26/11 - Cortec CorPak® Stretch Film Featured in May Issue of Spray Technologies Magazine! 05/17/11 - Cortec Products Certified for USDA BioPreferred biobased labeling! 12/16/09 - Cortec Websites Bursting With Innovative Renovations! 09/23/09 - Cortec Launches Three New Websites to Meet Customer's Needs. 08/13/09 - Cortec Launches New Website for Packaging Solutions. 08/05/09 - Cortec Products for Hydrotesting / Lay-Up. 07/20/09 - Oxo Additives Create More Problems Than They Solve. 07/13/09 - CCP 'Recovers' $170,000 from Innovative Heat-Recovery System. 06/26/09 - Cortec 'Rocked' the 2009 World Sales Meeting. 06/18/09 - Cortec Weekly Email Has A New Look! 06/04/09 - Cortec has a new voice! 05/27/09 - Cortec India's 2nd Training and Sales Conference is Naturally a Success! 03/26/09 - Cortec Corporation Celebrates 15 Years of ISO Certification! 03/18/09 - Cortec Spray Technologies - Were Back and Better Than Ever! 03/13/09 - Eco Works now produced simultaneously in North America and Europe. 03/03/09 - Cortec Teams up at 17th Annual USCC Conference. 02/25/09 - Cortecs VpCI Becomes a Registered Trademark. 02/19/09 - Cortec Unveils New and Improved MCI Website. 02/12/09 - Cortec Provides New Website for Water Treatment Solutions. 12/29/08 - Cortec Eco Works - Not Your Average Bag. 12/04/08 - Cortec strives to keep its employees safe and to comply with the OSHA laws. 11/24/08 - More RoHS and SGS Reports Available for Key Cortec Products! 11/11/08 - New use for Cortec VpCI: Inhibicards by Inhibisystem. 10/31/08 - Cortec Corporations MilCorr VpCI Shrink Film wraps up the Marines. 10/30/08 - Cortec European Sales Meeting 2008 - Double Success. 10/21/08 - Cortec part of innovative video business profiles. 09/16/08 - Cortec product launch successful in Ecuador. 08/11/08 - Cortec is excited to announce its 3rd generation masterbatch M-126/3. 03/17/08 - New Record for Cortec Advanced Films! 02/15/08 - Cortecs Christophe Chandler PhD contributes to NACE standard on VpCIs. 02/14/08 - Cortec Corporation Always Improving on Productivity! 01/31/08 - Cortec Corporation Announces Stock Products for European Market.